This past weekend we attended the wedding of some friends. The wedding celebration included a ride on an old train and the ceremony took place in a train restoration building. The train held special significance for the couple as they met on this train and he proposed to her at the train station. In keeping with the theme of the wedding, and to honor the place of trains in their love story, I made them this wedding card. Not at all a traditional wedding card, but one that suited this couple and their special day perfectly. 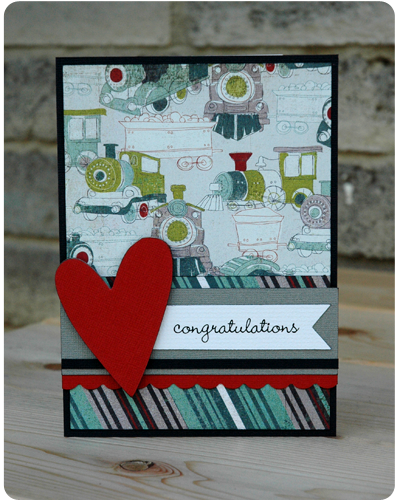 This is one of the best things about handmade cards - you can make a card that is specifically tailored to the recipients; I would have never found a train themed wedding card in the store, but was able to make one.